Ever since people started collecting things, part of the human race started making fakes to sell to them. Some of the more famous ancient counterfeit items include Egyptian artifacts that were sold to European travelers. Thousands of viewers were fooled over the years by the “relics of Joan of Arc,” which turned out to include, among other things, an Egyptian mummified cat bone. The ancient Romans were frequent victims of fake currency. Counterfeiters would mix various metals, cast them as coins and plate them with either gold or silver to create a much less valuable copy of the money. Old coin molds have been found that prove the existence of a widespread counterfeiting operation by Roman Empire-era criminals. As in ancient times, embroidered patch collectors today can be fooled by fakes that are sold as the real thing. It is important to compare and contrast examples. In the 1990s, the owner of a small patch company was arrested by the FBI http://articles.chicagotribune.com/1993-08-12/news/9308120250_1_jamboree-badges-traditional-civics-badges-michael-w-welsh for selling bootleg versions of unauthorized Boy Scout patches at a national jamboree. Rare Boy Scout patches are very desirable and as a manufacturer for the national Boy Scouts since the early 1950s, the Chicago Embroidery Company made many of the patches that are now collectable. It takes a fine eye and knowledge of Schiffli embroidery manufacturing technique to spot a fake patch. 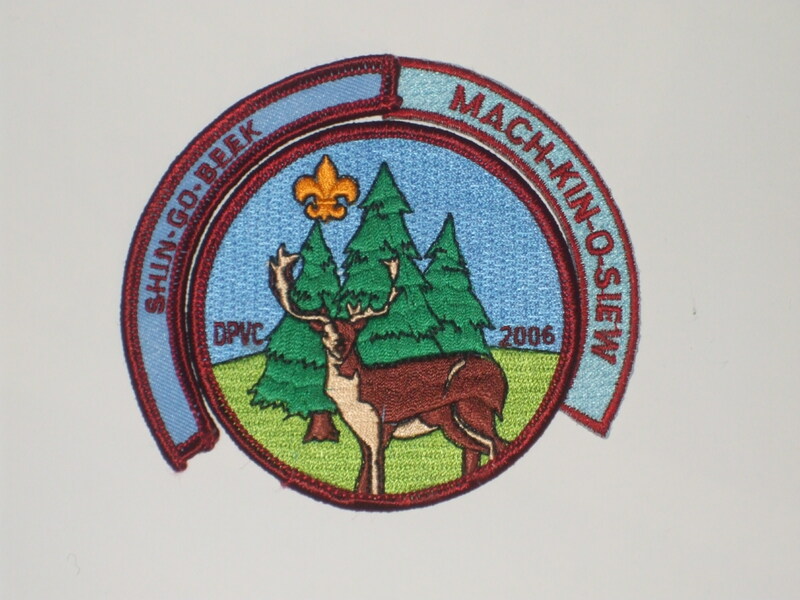 Today, most embroidered patches are made using multi-head direct embroidery machines. These sewing machines produce great looking patches but the embroidery stitching tends to be “flat” compared to embroidery made on a Schiffli loom. Schiffli loom embroidery machines tended to be used less, beginning in the 1990s when computerized sewing machines became more cost-efficient. Embroidered patches produced earlier than the 1980s were most likely made on Schiffli looms. The pictured example shows a Super Bowl IX patch that was made on Schiffli loom, note the texture of the raised stitches. A counterfeit Super Bowl IX patch recently for sale on Ebay as “original” appears to be a fake, and shown here the embroidery looks tighter and flatter than the original. Note the difference in the backgrounds and other details. Roman numerals on the patch (this one is 14) denote the big game. professional football, the National Football League’s Super Bowl. First played in 1967 (the 1966 football season) as a contest between the NFL and the then rival upstart American Football League, the Super Bowl game and surrounding pageantry has grown into a de facto national holiday and major retailing event for a variety of products. 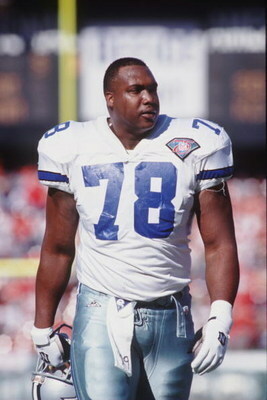 Players in the Super Bowl were an embroidered patch, usually on the jersey shoulder or sleeve. Ever since the early Super Bowl games, players from each team have worn a commemorative embroidered patch on their jerseys. Initially, these unique emblems were only available to players, but over the years, the patches have been sold to the public and a vibrant collectors market has developed. 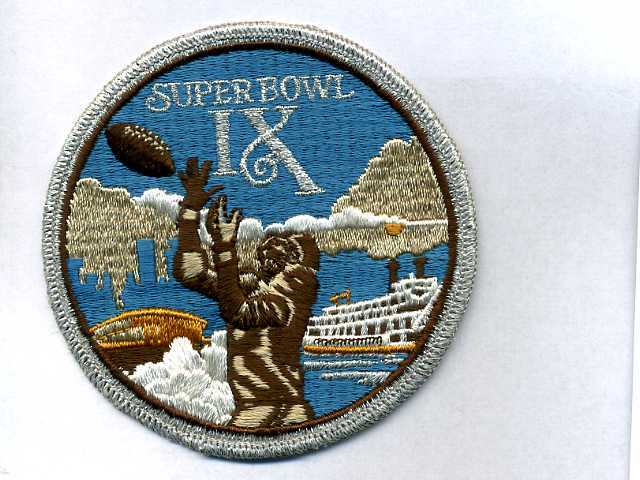 This patch for Super Bowl IX (9), played in New Orleans, was made by the Chicago Embroidery Co.
game was played, and graphic depictions of footballs, the Super Bowl trophy and more. 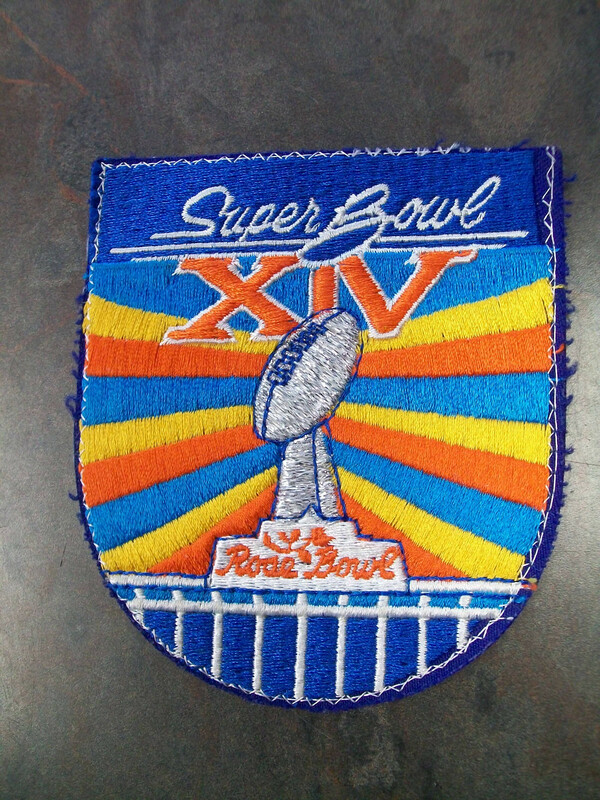 This patch for Super Bowl IX was created by the Chicago Embroidery Co. for the big game in New Orleans. 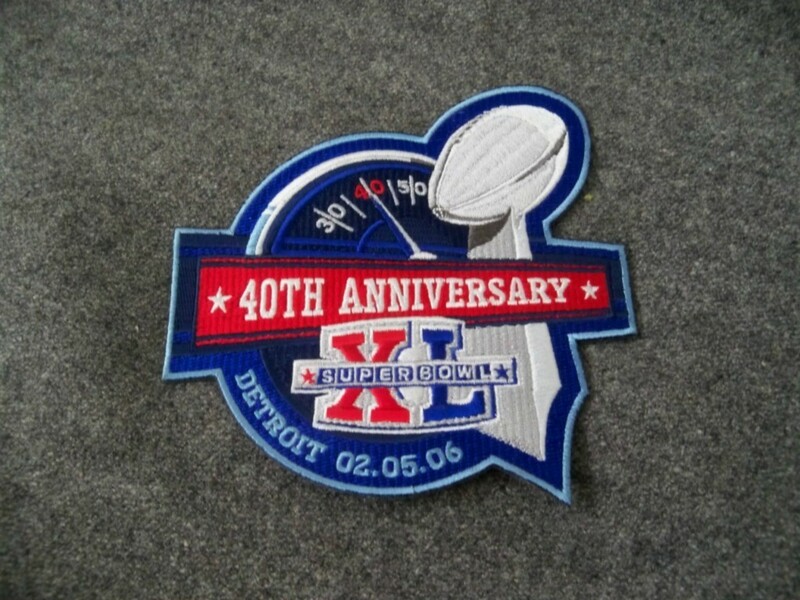 This patch marks the 40th anniversary of the Super Bowl. this special event. 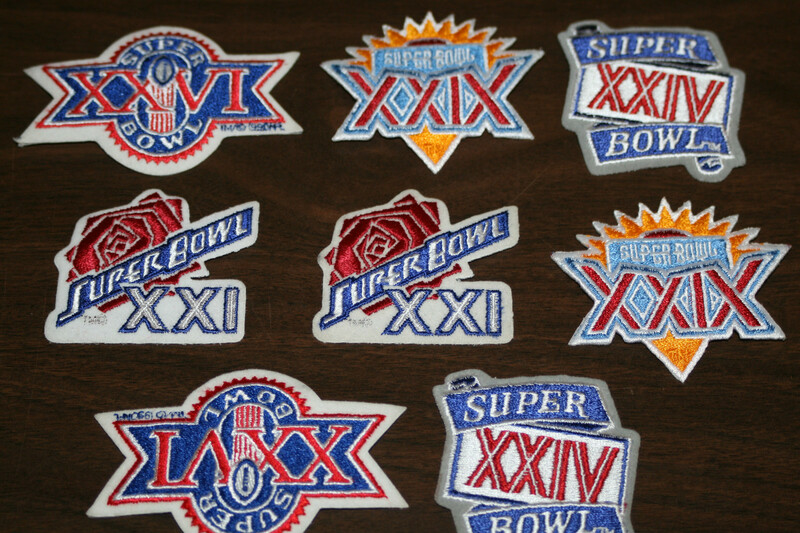 Some winning teams even commission their own Super Bowl patch, while many unofficial patches also appear on the market. 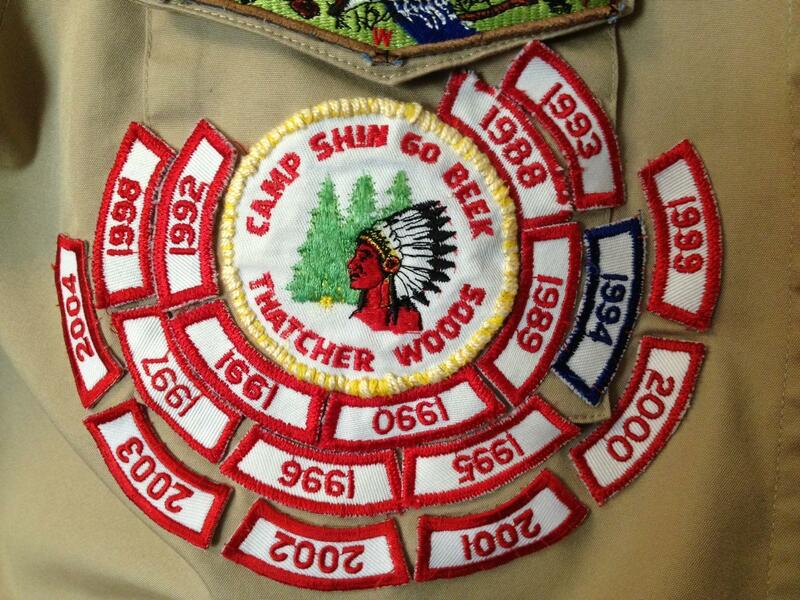 Annual participation in an event is signified by the addition of yearly rocker patches. A good way to stretch the usability and life of an embroidered patch for your organization is the use of auxiliary patches, commonly known as “rockers.” These patches, usually semi-circular in shape and resembling the business end of a rocking chair, are arranged around an organization’s circular patch to showcase accomplishments, dates, meetings/gatherings and virtually anything. Specific, different locations are highlighted with individual rocker patches. ability to provide group members with a single, undated organization patch that can be purchased in bulk at considerable savings. This patch, sewn on a pocket, shirt sleeve, or even a duffle bag or other item, can then be customized by individuals as they earn recognition, awards or attend events with the addition of rocker patches around the main organization embroidered emblem. 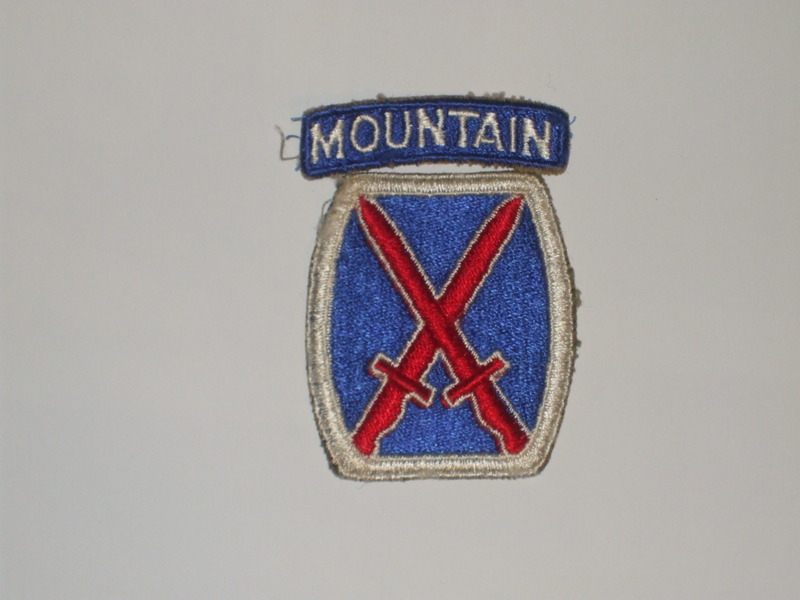 The addition of a rocker patch to the unit insignia pleased members of the US Army’s 10th Mountain Division. Veteran members of the organization will proudly display their collection of rockers earned through many years of active participation.These rocker patches, being much smaller and simpler than the main patch, are considerably less expensive to produce. 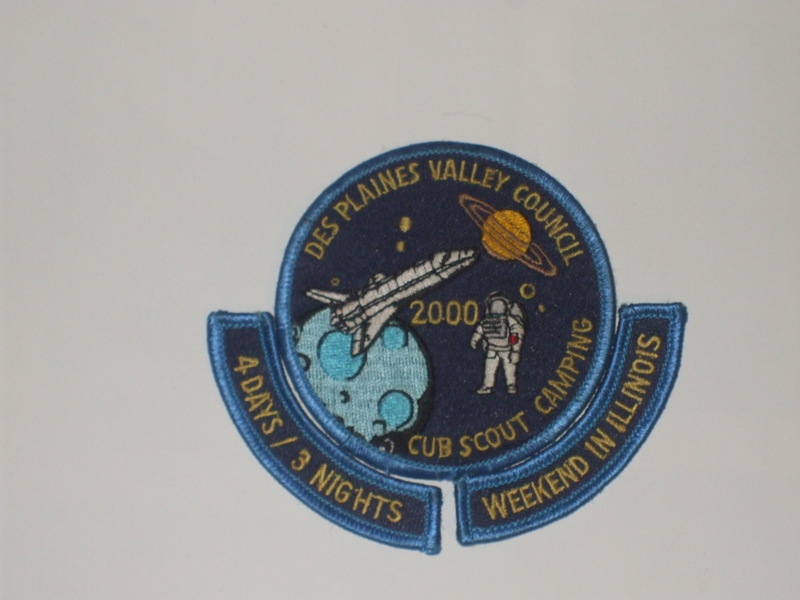 Usually a single color and employing a basic design, rocker patches can be created for a single event or honor in a smaller and less expensive production run. Rockers don’t have to be semi-circular, other designs use an inverted V chevron, bar, slash or other shape, building off the design of the main embroidered patch. Different related activites are represented by rocker patches. To learn more about increasing the visibility of your organization or building team spirit through the use of embroidered patches and rockers, visit www.c-emblem.com or call 312/664-4232..